• Join the brains of the Ghostbusters squad, Spengler, as he battles the glow-in-the-dark Ghosts! 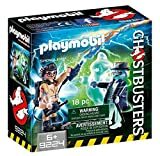 Join the brains of the Ghostbusters squad, Spengler, as he battles the glow-in-the-dark Ghosts! Using his practical approach, he is able to face off against two ghosts simultaneously, capturing one in his ghost trap while battling the other. Set also includes proton pack and proton wand. Recommended for ages 6 and up. Warning. Choking Hazard. Small parts. Not for children under 3 years.